Black pepper, which is a common ingredient in the kitchen for any kind of cuisine has some tremendous benefits that are less-known. Regular consumption of black pepper can reap you many benefits in the long run. It is very rich in some nutrients like potassium, dietary fiber, vitamin C & K, manganese, etc. It not only helps you to treat cough and cold, but also helps against intestinal issues, cancer and even helps your skin and hair. The health benefits of black pepper, also known as Piper Nigrum are substantial and are still being investigated. It is undoubtedly the most versatile and used spice of all time throughout the world. Not only has pepper sits next to the salt on the table, but it has many great health benefits that can be easily utilized. Many studies conducted on black pepper have also revealed that consumption of black pepper can block diabetic complications, serve as a potent antioxidant and can fight colon cancer too. It also possesses the power to augment the bio-availability of nutrients from food and supplements. Following are some of the benefits of black pepper, which will make you include it in your everyday diet if you don’t already have it. High content of vitamin C gives it natural antibiotic properties which help in fighting against harmful free radical reactions. Black pepper’s ability to fight cold and cough has been known for ages. It has some antibacterial properties that help against all kinds of respiratory diseases. Black pepper releases hydrochloric before the consumption of food which eases the process of digestion and helps against all the stomach-related issues. Black pepper not only increases metabolism, but also helps in burning extra calories and reducing the extra belly fat. Consuming this spice daily also helps in keeping stomach related problems at bay. 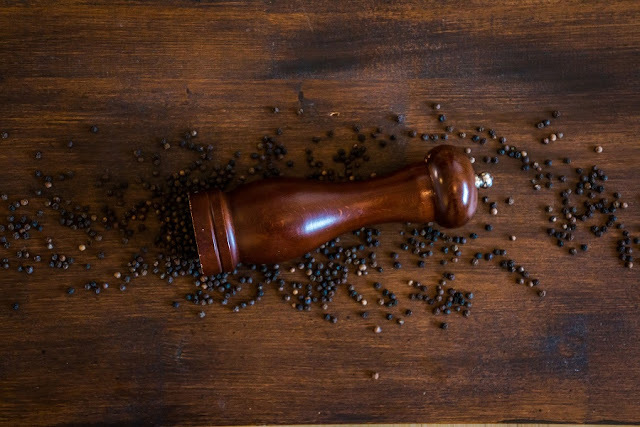 Black pepper keeps a check on your blood pressure from getting very high. Rich in potassium, black pepper controls the blood pressure level naturally. The Anti-bacterial properties present in Black pepper does a great job at treating diseases that are caused by bacteria like diarrhea, colic and constipation. The oil made out of black pepper gives a warming effect and improves circulation, which has great benefits against arthritis. Black pepper essential oil work amazingly to cleanse the unwanted toxins in the body like uric acid from the blood and helps to reduce the pain from rheumatism, gout, and arthritis. Vitiligo is a skin disease which causes skin to lose pigmentation in some areas. Piperine which is found in black pepper helps in instigating the production of pigmentation and is a safe remedy for the skin. Piperine is a substance present in black-pepper that works as an antidepressant in the body. Black pepper increases the production of serotonin in the body that acts as a neurotransmitter and regulates the mood. It also reduces the stress and prevent you from anxiety and melancholy. Black pepper helps against skin cancer that is caused by exposure to the UV radiation. Rich in antioxidant, Black pepper or piper Nigrum is also very useful in treating cancer, particularly, breast and colon cancer. Due to its polyphenol content, black pepper can protect you from high blood pressure, cardiovascular diseases and diabetes. Black pepper/Piper Nigrum is the remedy to treat a stuffy nose as well as congestion due to its ability to loosen phlegm. The antimicrobial properties of Black Pepper are also highly beneficial in curing Flu naturally. All you need to do is to take a lukewarm water and mix half teaspoon of black pepper in it and drink it two to three times to clear the respiratory system. Many researches and studies conducted on Black Pepper/Piper Nigrum has shown that, this spice does not only add flavor to the dishes but also improve the appetite through olfactory stimulation. It is also highly effective in promoting digestion and works wonder for treating poor appetite. Due to the presence of the Phytonutrients in the outer layer of black pepper, it is one of the best remedies to lose weight naturally. It also helps you break down the fat cells in the body. Black Pepper/Piper Nigrum is one of the best spice to eat that helps you improve your overall health as it provide your body an ample amount of nutrients like Vitamin A and C, beta-carotene and selenium. Black pepper can be used to treat problems like bad breath and bleeding gums and can also help you get rid of pain and inflammation. It is very beneficial in fighting tooth decay and providing a quick relief from toothache. This spice is known to generate free radical killing action that work to stop the cancerous activities in the body. Black pepper essential oil is well known for its carminative properties. Intake of this oil helps in preventing and treating flatulence. It also works to stop the growth of stomach gas causing bacteria. The purgative properties of Black pepper essential oil is good for the system. It works to cleanse the intestine and prevents infections from occurring in the digestive system and the excretory system. The piperine present in Black pepper essential oil exhibits mild laxative properties. The Diuretic And Diaphoretic properties of Black pepper essential oil helps in stimulating urination and sweating in the body. These properties help in removing the excess toxins from the body and also cleanse the skin. These properties help to remove the excess uric acid and salts from the body. Consuming black pepper also helps in lowering blood pressure and reducing fat and help you in losing weight. The diuretic property of black pepper also helps to reduce inflammation in the body.